To the humans she lives among, she's just the girl working at the snack bar at the beach, navigating the fryer and her first crush. But behind closed doors, she's learning how to harness her powers and fulfill the obligations of her destiny. Mentored by her mother and her Zar "sisters,"
Azra discovers she may not be quite like the rest of her circle of female Jinn . . . and that her powers could endanger them all. 1) The book is honestly painful to read, whether it's due to a smattering of grammar mistakes or baaaad characters. 2) Nothing. Nothing is happening. 3) I'm scared. I STILL haven't finished Clockwork Princess because of what happens in the epilogue. I refuse to acknowledge that. 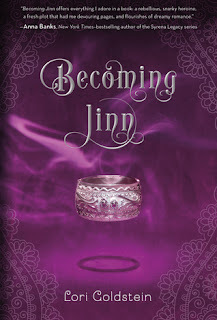 Becoming Jinn falls into number 2. Genies are such an interesting concept to read about, but this lacked originality. They all had powers, sure, but they all seemed like humans. Now, I wasn't expecting our main character to be a blue genie that floats out of a lamp, but some culture instead of Azra's WHINING. There was loads of why me, i don't want this, wah wah wah me me me. As far as I got, the plot still hadn't developed. So I'm not entirely sure what the book was about. The writing seemed a bit shaky at times. It didn't always flow well and there were superfluous descriptions. For example, I honestly didn't need to know what everyone was wearing or what Azra was changing into everyday. Not much more to say about this, it was just pretty boring in the beginning and I had no desire to read any more. Definitely a disappointment, it had sounded really good.